This is beautiful! I love the cut of your dress. The scoop back is perfect and looks wonderful on you. I'm kind of in love with your amazing hair pin too. Love this dress! I'm sure you were the loveliest gal in the room! Such a gorgeous LBD! I really like the cut around the shoulders and on the back. Your bright, patent red shoes really make the outfit pop! Great LBD choice and those shorts are adorable! 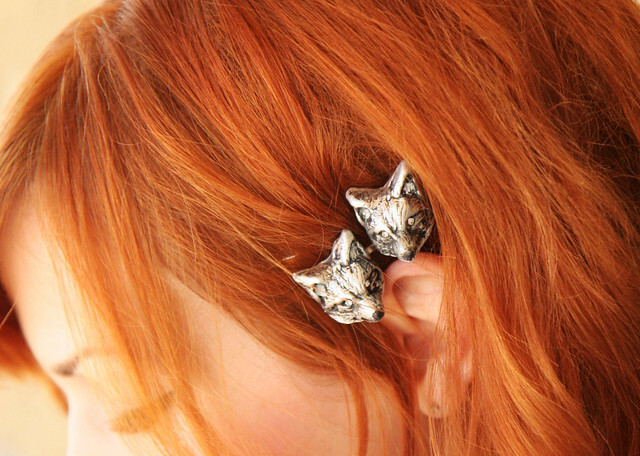 Oh my God, these barrettes are amazing. I need these! And I love your dress! Very well combined. That dress is so pretty. The shoes look amazing with it. Very cute dress. And I must say every time I see your hair I fall in love with it haha. 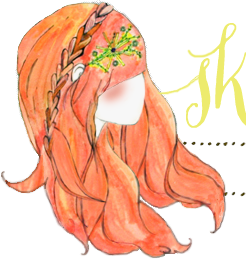 Your hair is SO gorgeous! Too cute. :3 I love this dress and the hair pins are adorable as well. Such a perfect little black dress :) love you shoes and those hair pins!! perfect outfit, you look beautiful. I love the overall look, but mint nail polish is the top choice. that dress is just gorgeous! and those shoes...sigh! I like everything about this outfit, but I especially like the low, wide V in the back of the dress, and the lace shorts under it. Too cute. And those Sea of Bees barrettes - so darn cute! What adorable dress. You can never have to many little black dress! You're adorable! That fox pin is just the best too- so cute! This is a super cute look! Dress, hair, nails, and the two little foxes - lovely! I LOVE this outfit, you are just too cute! I love this dress. You made a great choice wearing it. You look fabulous. Have a great day. That is so cute! So simple and chic. Great styling! Never seen red and black look better together. I love the shoes. I love how the back of the dress shows off your tattoo perfectly! Katie, Your dress is adorable. My favorite part, those stinking cute white lace knickers. Don't think I'm a perv, they are just so cute with the dress and shoes. Just fantastic. A wonderful lbd! Love the back and the hair clips especially! What a lovely choice for the Opera! And you totally look good in black. I just got back from the desert and did a little outfit photo diary - take a look! i love the back and how it shows off your tattoo! Katie, you are absolutely gorgeous! I love those vintage bricks for the background as well. So in love with the fox hair pin!!!! Gorgeous lady. I just found your blog and wanted to tell you that it might be my new favorite blog. Ever. Amazing shoes, I hunting for a very similar pair for myself. Fox pins are fab too. Absolutely love your blog - the posts always inspire me and this blog is a main reason why I've decided to start posting on mine once more. They're just such a great tool for sharing what you love, and you do it so wonderfully. Thank you! I am loving EVERYTHING about this look. You are such a doll! Hey Katie. You can't imagine how happy I was to have found your site. I love your outfits, your accessories... And the styling is just so fabulous. I love all the stunning pix. They look so great on my S3 phone. Thanks so much.